Frankenstein (1931) is a story so ingrained in culture that even someone who has never watched Frankenstein will recognize many of the moments. There are many reasons this is a classic. It begins seeing Henry Frankenstein and Fritz retrieving bodies highlights shows their devotion to the work as well as their mental unbalance. The exploration of criminality being the result of a malformed brain is a subject worthy of more time though they begin to use it as a crutch in later movies. The film leaves the Monster's (and the Mob's) morality for the viewers to decide which is a great decision. The themes of starting a new life through artificial means, marriage, and conceiving a child are dispersed throughout. The marriage and festivities being show right alongside Frankenstein playing and then murdering the little girl is brilliant. The child murder scene is handled with such gravitas with the man bringing her body all the way through the city as people slowly took notice resulting in a perfectly chilling result from its innocent conception. 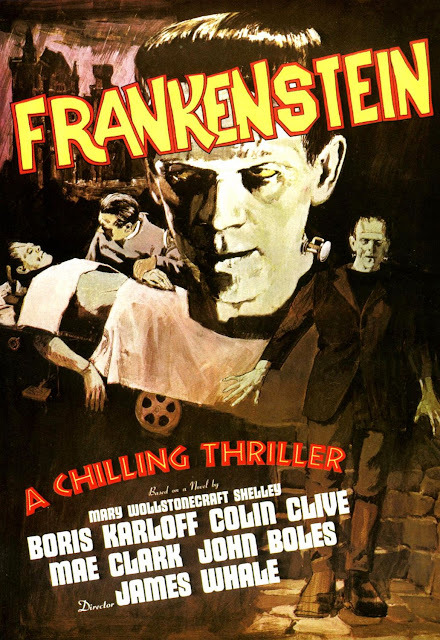 Doctor Henry Frankenstein is a caricature of a mad scientist for most of the movie, but the times when he shows concern for his wife or the creature are when he's at his best. The balance of sanity and insanity is also explored, but as he's left mostly insane with not much sanity around him, this falls flat. Once his work is complete he becomes disinterested and abandons it after he realizes it may be flawed. This is not the most persistent version of the good doctor. Fritz is his loyal sidekick and has become a joke himself. Here he is played for comic relief. He appears most as a loyal friend to Henry and a true believer in his dreams. This is something that could be explored more, but he disappears about half way through the film never to return. Elizabeth is first introduced with a friend talking to Baron Frankenstein about his son's increasing insanity. She begins as a misinformed believer and ends as a screaming victim. Also, Elizabeth's premonitions of something tearing them apart are strange. The audience could have gotten to see her pining over him while he's away in the castle or something. Alas, she was somewhat underutilized, and her performance wasn't quite up to par. Doctor Waldman is a science expert who provides some necessary exposition about the criminal nature and Henry's past. It would have been nice to see Henry's past, but Waldman does have a nice cadence and it really feels like he has known Henry for some time. Little Maria is the girl who dies and her performance is both effective and touching. However, the most distracting thing about her was in her first scene, as she is saying goodbye to her father: the kitten she is holding clearly does not want to be there. Other than that, her acting is quite impressive and really makes you feel for her. Baron Frankenstein comes off as kooky and out of touch. He was meant to be a sane foil to his son, and he is certainly grounded in the world of responsibility and privilege. However, he believes his son is having an affair in an old lab? This strains a bit of the story's credulity. The true villain of this piece is the mob. They go from revelry to insane rage in one of the finest displays of human vengeance ever put to the screen. Also, none of them have pitchforks in this movie, who knew? The Monster is excellent. From his dead eyes and jerky motions, he really does resemble a massive infant. His innocence spliced with rage about not understanding why he can't do whatever he wants. He doesn't come off as evil nor does he deserve to be hunted down and killed. This is an interesting departure from the book. In the novel he is intelligent and cautious, but more on that in a later post. The sets are gorgeous and live up to the classic image. The castle looks ominous, the lab is the picture of madness, the windmill is claustrophobic, and the mountain is vast. The village and farmhouse are sufficiently friendly to contrast nicely with Frankenstein's ghoulishness. It is, naturally, beautifully shot with only a few instances when there is some overlapped footage or odd transitions. The monster's fate remains ambiguous, which is perfect. The ending was quite jarring but fits the series. The final scene with Baron Frankenstein and the maids is one that must be experienced with the movie. This movie hasn't aged as well as others, and, with more explorations of its characters and themes, it could have been even greater. This is a solidly separate entity from the novel. Though I like the novel better, this is far from the brainless romp that I remember from my childhood. It is a great movie, if a bit dated, and explores interesting territory. The macabre moments blend together to make this film shine. This classic needs to be seen. PS: In the opening credits it says "From the novel by Mrs. Percy B. Shelley," and this is rather insulting. Why doesn't it say Mary Wollstonecraft Shelley? His last name would still be there. There aren't any other females involved represented like that. The time period is largely to blame, but it is still irksome.